Relais Fenicottero Rosa is the ideal place for a peaceful retreat with its gentle atmosphere and well-renowed standards of service. 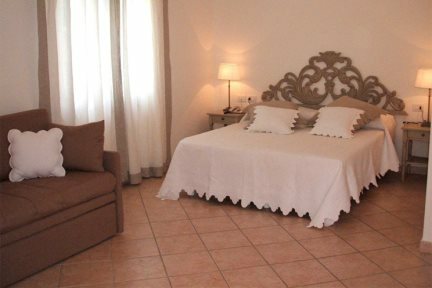 This hotel is a small, family-run hotel near to the quiet town of Porto San Paolo, south of Olbia. 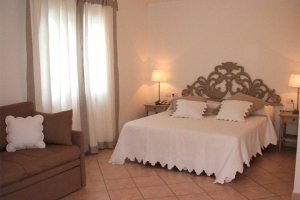 The hotel has just 11 rooms – all of which are a very good size and individually themed in a traditional Sardinian style. Although some of the rooms look towards the quiet road outside the property, the majority face the lovely pool area, with its surrounding lush greenery and low hills beyond. The hotel has a reputation for its breakfasts, which are all made from locally sourced produce – you can enjoy your breakfast in the cool eating area, or on the shaded patio overlooking the pool. There is also a wine lounge where you can enjoy an evening drink whilst you decide where to go for dinner. Beyond the hotel, you have some of the finest beaches on the east coast – the nearest of which, Porto Taverna, is only a 15 minute stroll away. Here, you can relax on sun beds, enjoy a drink at the bar or, if you’re feeling more energetic, try out a pedalo. The beach looks out towards the twin limestone islands of Tavolara and Molara, and you can take lazy boat trips to the former and explore the secluded coves and beaches. The boat trips leave from Porto San Paolo, which is only a short drive away and has a good selection of bars, shops and restaurants. There is also the near-Tahitian splendour of the Cala Brandinchi, one of the finest beaches in the Mediterranean, never mind Sardinia, and only a 15-minute drive from the hotel. All in all, this tranquil hotel is perfect for couples looking to get away from it all and is a welcome addition to our programme. Swimming pool, breakfast room, Wi-Fi in reception, Wine Bar ‘L’Isola dei Sapori’. En-suite facilities, air-conditioning, safe, minibar, telephone, satellite television, hairdryer, terrace or balcony. Double bedroom with balcony or patio, all equipped with a sitting area, a private bathroom with a shower, air conditioning, telephone, satellite television, hair dryer, refrigerator, room safe, garden view or pool view. Around 15km south of Olbia lies the small, colourful town of Porto San Paolo. It has a number of restaurants and bars, and is a lovely place to spend an evening enjoying an aperitif and some of the fine local cuisine. The town has a fine view across the bay to the twin limestone islands of Tavolara and Molara, and you can take boat trips to Tavolara and explore the island's secluded coves and beaches and take in a meal. In July, Tavolara is home to a vibrant festival where you can watch films in the open air. There is also the 9-hole Puntaldia golf course, just 9km from the hotel where you can hire clubs and relax in the sunshine. There are some fantastic coves on the way to Capo Ceraso with views across the bay of Porto Istana to the islands of Tavolara and Molara. Backed by perfumed macchia and surrounded by pink granite rocks, the setting here is truly enchanting and typically Mediterranean. If you are looking for something less busy, head for Capo Coda Cavallo. The larger beaches here have some facilities in high season but this headland is well worth exploring as there are many hidden coves undiscovered by the masses. Just south of Capo Coda Cavallo lies a sweeping bay that could be mistaken for being a Polynesian picture-postcard. Accessed via an unmade track, the beach is sheltered and lapped by near translucent and very shallow water – perfect for children. The main beach here is La Cinta which stretches north from the town with 5km of glistening white sand. This is a very popular beach, especially in July and August so be warned. There are plenty of facilities at this beach including water sports activities and snack bars. Take a boat trip to the dramatic islands of Tavolara and Molara and spend a day discover the spectacular beaches, go snorkelling or simply relax on the deck of a sailing boat. The old quarter of Olbia is definitely worth a visit. The centre bustles with cafés, traditional restaurants and little boutiques, whilst the weekly market attracts visitors every Tuesday and Saturday – a great way to experience local Sardinian life. Sample traditional Sardinian cuisine in a farm restaurant - amongst the most mouth-watering specialities are roast suckling pig, pecorino cheese or Sa Panadas, delicious savoury tarts. A dazzling stretch of coastline of pristine shallow water, white powdered sand and dramatic granite outcrops, the Costa Smeralda is definitely worth a visit. Lined with magnificent yachts of all shapes and sizes, it is also the ideal spot to lounge in style and enjoy a spot of people watching.